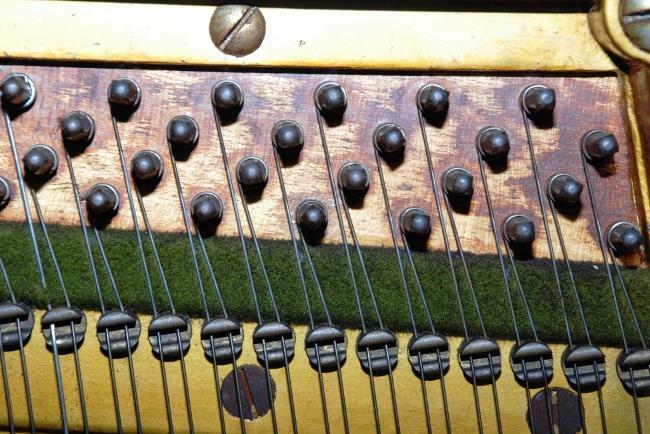 The Wrest Plank of a piano is the thick hardwood plank, generally laminated in layers, which holds the Tuning Pins in place. In USA terminology it's called the Pinblock. The wrest plank of this 102 year old piano is nice and clean and in very good condition. Now look at the wrest plank of another 1911 Bechstein model 10 just a few miles away. Probably these two instruments were shipped to Britain together on the same boat, in the early 20th century. This dark staining was puzzling and I asked the owner about it. He explained that a previous tuner had sprayed the tuning pins and wrest plank area lightly with WD40. As far as the client could recall, the rationale for this was to help break any rust bonds on the string coils where they wrap around the tuning pins. I didn't like this idea. However, I'm always willing to believe that others may know valid methods that I don't know. 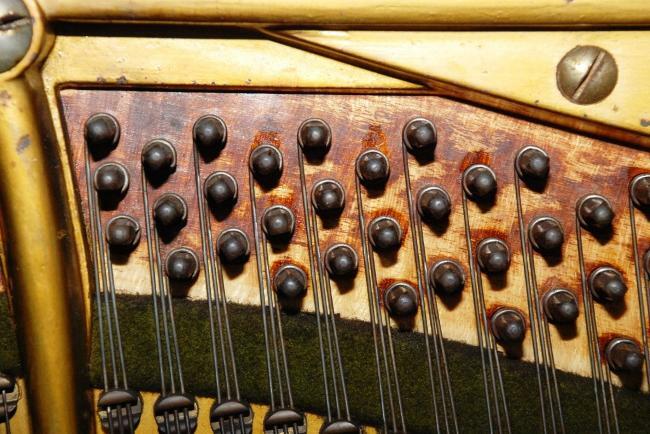 So I asked for some opinions from an online international piano technical group that I've contributed to for years, whose participants include expert piano builders, re-builders and restorers all over the world. As I anticipated, the view taken of this procedure was an entirely dim and censorious one. WD40 is an excellent product for its intended applications. I am not knocking WD40 at all. 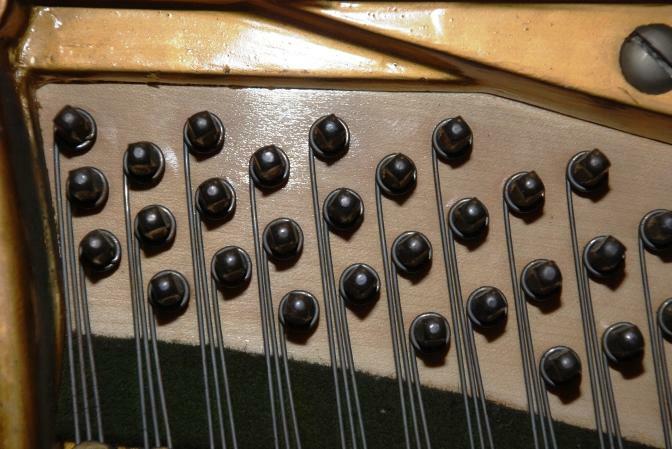 But its intended applications do not, and should not, include anything anywhere near piano tuning pins. I've since seen other pianos which have had this WD40 treatment. The main problem is not the unsightly discolouration, but the propensity of the WD40 gradually to seep down the length of the tuning pins, causing them to slacken in the holes and to become so loose that they can't be tuned. This doesn't happen immediately, but over a period of weeks or months. Does this mean that if your piano has had the WD40 "treatment" it is irretrievably ruined? Not necessarily. The quantity of the WD40 is finite and once it has spread as far as it can, then there's no more to go anywhere else. And it seems that the CA treatment described in one of the Technical articles on this site, also reproduced below, will enable the tuning pins to hold properly in the wrest plank again. (in one of the photos above, you can see little shiny circles round some of the pins; that's where I applied the CA treatment). Please note however that if your piano has had this WD40 'treatment', I must with regret decline to attempt to tune it without remedial treatment first. Part of the reason for this is that the slipping effect is insidious and occurs over time. 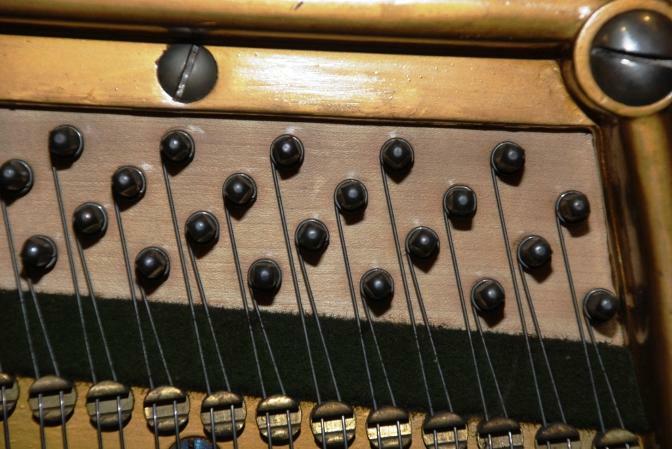 A piano recently sprayed with WD40 may tune OK first time around, but then after some weeks or months, the WD40 causes some tuning pins to slip - suddenly, and far. 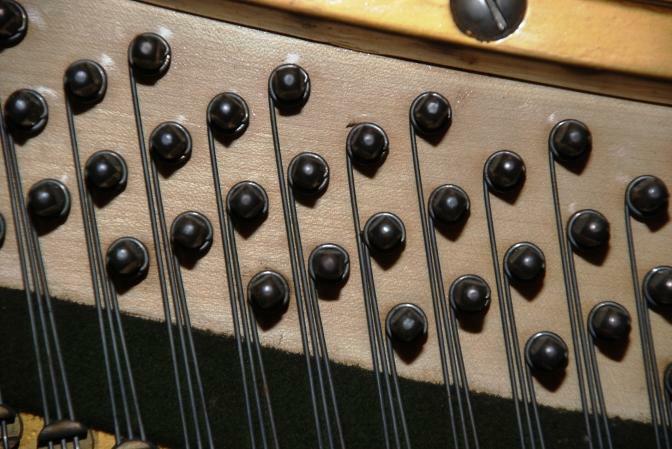 If your piano is a high quality one that has been "WD40-ed" it is worth taking the remedial steps outlined. But if it is an older overdamper piano perhaps nearing the end of its useful life, it's probably not worth it. 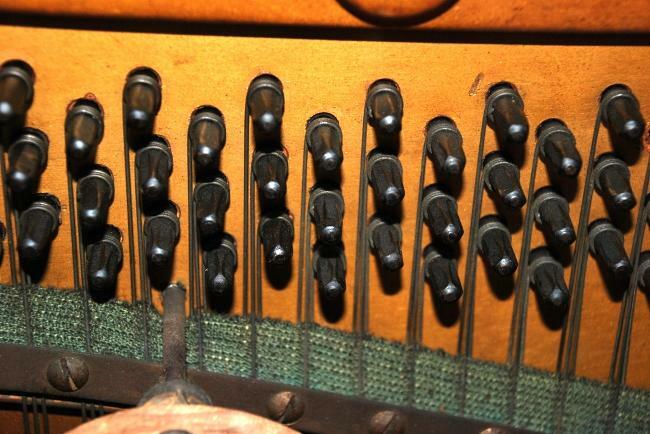 Here's another WD40'd set of tuning pins seen recently, on a 1920s upright. 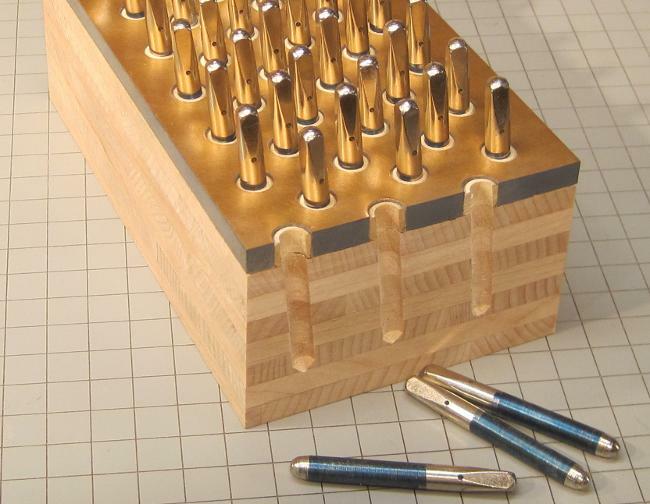 As soon as I opened the top lid the sleek, dark, oleaginous look of the tuning pins gave the game away. And sure enough, there was the label of the Phantom WD40 Sprayer of Olde Glasgowe Towne. The owner confimed that this person had sprayed the tuning pins with WD40, just over a year ago. Many of the pins had become very loose. CA treatment effected a cure, happily.